LOUDNESS SOUNDS BETTER. It’s Also Ruining Music. LET’S TALK ABOUT LOUDNESS! Yelling is loud! That fashionable guy on the train blasting music into his ears? His headphones are loud! Loudness sounds good and feels good, and unfortunately, it’s ruining recorded music. The concept of loundness is deceptive, because loudness is not a discrete physical property of sound, but rather how we humans perceive the strength of sound. It’s psychological as much as physical. I’m not going to get too far into the physics here, but I want to discuss one particular facet about loudness, the one that ultimately leads us to want to Turn It Up. First off, there’s a difference between loudness and Sound Pressure Level, the measurable disturbance caused by a soundwave at a given point, usually denoted in decibels or dB. It’s also not the same as volume, which is technically the amplitude of a sound wave. We’re talking about what your ear and brain perceive versus what an instrument like a microphone perceives. The ear is not a linear device-its response varies with frequency. Hearing sensitivity peaks in the high-mids and falls off at the extremes, and the hearing curve also changes with volume, becoming slightly flatter at higher SPLs. In order to maintain a perceived balance between high and lows (and mids and low-mids, and so on) a “flat” playback system may need to be EQ’d differently for different levels of reproduction. So if the low-mid-high equalisation of your sound system—speakers, headphones, whatever—isn’t properly calibrated for the sound pressure level you’re listening at, you’re going to push the volume up until you hear everything sufficiently—or until it’s too painful to go any louder. The result is that music sounds better when when you turn it up. For the last 20 years or so, music producers have been caught in an audio arms race dramatically referred to as The Loudness Wars. To better please the ears of potential customers, record producers started mixing records at higher and higher relative loudness over time. The problem is, pushing up audio levels has a damaging effect on the quality of the recording—so much so that a movement of professionals has tried to put an end to the so-called war, though to no avail. Let me explain why. In the transition from analogue to digital production, recording and mastering engineers were afforded a huge expansion in what’s called headroom—this is how high you can push the sound levels in a recording before they distort. Understanding that people perceive loud music as better, producers pushed audio levels up higher and higher and higher over time. Pushing recording levels up wouldn’t be a bad thing in and of itself, since, you know, the listener with her hand on the volume knob ultimately decides the playback level. But the slow creep toward louder mixes led producers to crush the dynamic range in recordings in an effort to push levels as high as they can go. This means that rather than allow a recording to retain its natural quiet moments and loud moments, everything is pushed as loud as possible. In more technical terms, “crushed” dynamic range means that over the course of a recording—say the duration of a song—the average difference between the loudest and quietest moments gets smaller. Now, back in the old days of recording you would set the overall level of a recording so that the loudest sound wouldn’t distort. You might use equalization, filtering, and mixing tricks to raise certain other frequencies, but the overall idea was that you wanted things to sound natural. Some parts of recordings were quieter than others. That’s normal! If you go see a band play live, the show isn’t one uniform sound level the entire time. But the loudness war caused producers to use their arsenal of tools to push quieter parts of songs to increasingly higher levels, compressing the dynamic range, or worse, pushing audio levels past the usable headroom and causing distortion. In the later case you ruin and/or lose entire parts of the recorded information. In the former case, you get an unnatural sound that audio nerds argue isn’t as emotionally satisfying. Music with natural dynamic range is often said to be more emotional. The swings in dynamics are like the pacing of a film: The scares in a horror movie are more intense because of the anticipation building up to them. People with different ears hear different things, and if you’ve never been trained to listen for dynamics in music, you might not be able to tell the difference. What’s certain is that loudness infused music sounds unnatural. Even if that’s not unpleasant to you on an aesthetic level, some people suggest it can lead to listening fatigue, which is that feeling I’m sure you’ve had, when you just can’t listen any more. There are a number of egregious examples of the creeping effect of the loudness wars. People love to cite Metallica’s 2008 record Death Magnetic as a prime case of the harmful effect of compressed dynamic range. It’s a terrible and unlistenable piece of music in the best case scenario. (It’s crappy metal no matter what.) 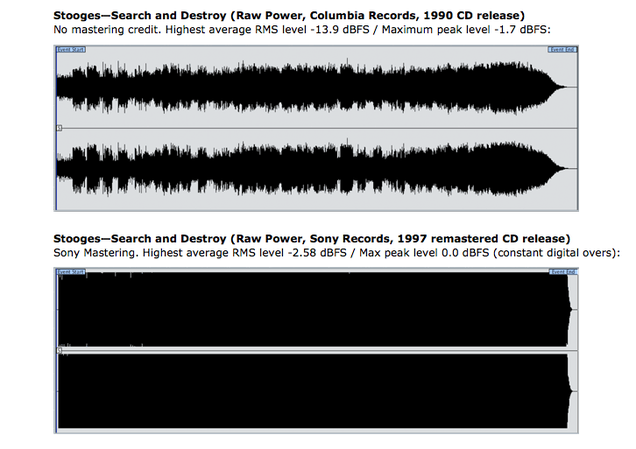 But if you want to compare pre-and post-loudness wars recordings, head over to this Spotify playlist assembled by Ian Shepherd and compare Metallica’s 1992 cut “Holier Than Though” to “Broken, Beat & Sacred” from Death Magnetic. Yes, heavy metal is loud! But in the former recording there are moments of relative quiet. In the later, you’re in a big flat hell. My favourite illustration of the loudness wars comes straight from the Chicago Mastering Service’s explainer on loudness (by far the most concise and clear explainer, which I refer to throughout and you should check out.) The engineers at CMS compare the recordings of a 1990 CD release of The Stooges’ 1973 classic Raw Power and the 1997 remaster of the same record. Image: Chicago Mastering Service. Like sound pressure level, loudness here is measured on in decibels, except this time the decibels are a level relative to the full dynamic range potential of the standard digital audio scale. There are a number of reasons why producers wanted to turn it up, but it boils down to this: If you want your tune to stand out from other music, the most obvious way to do that is to push audio levels up. What’s more, radio stations normalise their playback levels, and so do YouTube, Spotify, and iTunes. So even if you made your song louder, it’s not going to have an appreciable affect on the listener because every song is getting played at the same level regardless. And yet, the loudness war rages on. Some suggest that the continued push towards loudness can be blamed on the proliferation of crappy speakers. Even if you do have a nice stereo and good headphones, you’re also listening to headphones out of your phone and computer. Pushing loudness all the way up ensures that you’re not losing someone’s attention just because they don’t have the right gear. All gadgets have speakers nowadays, from cell phones to watches to computers to headphones to Bluetooth speakers that are small and monophonic. It is important that records are competitive, clean and loud on any reference speaker they are played. Indeed, this is precisely what lead Trent Reznor to release two different versions of the 2013 Nine Inch Nails Record Hesitation Marks. The main release is mixed in line with the reality that people listen to intricately produced electronic music out of tinny MacBook speakers. But Reznor made a special edition available for people with the patience and equipment to support a subtler mix. So WHAT IS TO BE DONE ABOUT LOUDNESS? It’s hard not to throw your arms up. Some exacting musicians with resources like Trent Reznor will make their music available they way they think it should be, but most probably just want their records to be mixed like the mainstream. It’s much harder to go against the grain—even if they know there’s an alternative. On the production side, many sound engineers try to spread the gospel of dynamic range. For example the Chicago Mastering Service’s excellent explainer begins, “Hopefully, some background information on this aspect of the mastering process will leave you better able to make the right decisions for your project.” But ultimately, engineers are powerless since they work for labels and artists. As for the labels? They’ve got much bigger problems than the concerns of audio geeks. One day we’ll probably look back and barely remember the loudness wars as a blip in the history of music production. The wars weren’t lost after any legitimate struggle. The music got louder. It wasn’t good, it didn’t make sense, but nobody cared enough to turn it down.